We have to be cautious, we have to be careful, with open eyes we must look at the world and be realistic regarding all things. If they begin to control me tomorrow, I won’t be able to run away to Sweden or some other country, so what? They can bring in an international police system, according to the Schengen Agreement they can control our coming in and going out, they can say for example that the Russian Patriarch is dangerous and order him to go back. In Greece the question has been posed whether to put the word “Orthodox” on passports. The Church got three million signatures that they would receive on passports the seal of an Orthodox confession, and the state ignored them. And see, this is half of the population who has a right to vote! There were people there who were paid from abroad, to show that Greeks are non-Orthodox. Many people in Orthodoxy have a tendency to easily make schism within themselves. But they don’t care about the fact that this is the way the spirit of sobornost is lost, that the Holy Spirit does not descend on a divided people. He descends on all, but it’s impossible to divide the Holy Spirit, and it’s impossible to “privatize” Him. On Mount Athos there are zealots. They wrote on the [Esphigmenou] Monastery: “Orthodoxy or death!” Why this? They even bought gasoline so that if someone were to come and force them out they could burn down the monastery. These are fanatics – this isn’t faith. But they are the few and this is not a characteristic of Athos. 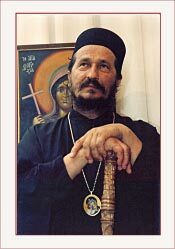 There are many holy fathers on Athos, there are people who live a true spiritual life, a living faith. It’s impossible to simplify life in such a way so that everything would be problemless and without offenses. “Woe to the world because of offenses,” said the Savior (Matt 18:7) and it is like this throughout history. But we musn’t be afraid of offenses, “for offenses must come, but woe to that man by whom the offense comes!”, as well as him who supports it, offending others. There is always a great responsibility for this, however, we should never impose our measure, that someone determine themselves as a measure, a canon. I remember being told how the abbesses in Petersburg were angry at Metropolitan Nikodim. And nothing, Nikodim was how he always was. He is not the measure of the Church, just as now I am not the measure, or someone else. Christ is the measure for the Church. We mustn't be afraid but we must be on guard that our souls not be offended – in this is the problem! I am not against zealots. God is my witness. And those diplomats who deal with Church politics, or even world [politics], and people in general of great importance, they forget that their zeal as Christians is also necessary. The body of the Church was always defended by its faithful, however, at the head of the faithful were always their pastors. The pastors are the priests, bishops, where the church’s most important organization is. The canons of the Church are also a holy thing. However, if oikonomia (economy) has been designated, if something needs to be done out of necessity, even if the canon is violated, this is exclusively for the salvation of man and not merely that the canon be violated.... See what has happened to the Greeks, those who respect the Old Calendar, poor unfortunates – they wanted to preserve the old style at all costs but then a great evil occurred – they’ve already been divided into five groups. It’s not good that the old style was changed but there are no dogmas about the calendar.... Fr. Justin, my spiritual father, was such a man who was ready to die for every word of the canons, but even at that time, that at least one soul be saved, a canon needed to be sacrificed.... This is the freedom of the Fathers.